Happy Boxing Day! The day started with my sweet, calm, little fluff-ball cat slapping the the doo-dah out of my dad. She wanted to be petted, he picked her up, and she attacked his face. I was upset with her...my parents kept saying "poor baby" to her. They're crazy, but at least no blood was drawn. Today's block - Three and Six - was made with gorgeous fabric bought with today's sale and my Christmas gift card. First day all month I haven't worn a Christmas outfit or used Christmas fabric in my block. Only 5 blocks left! 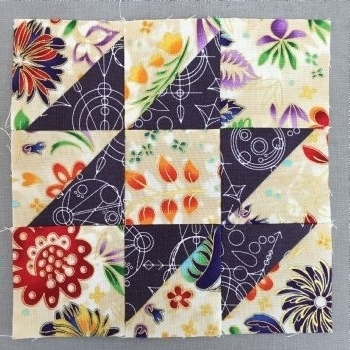 Interesting quilt block with such pretty fabric! Are you putting all of these into a quilt when you are done?